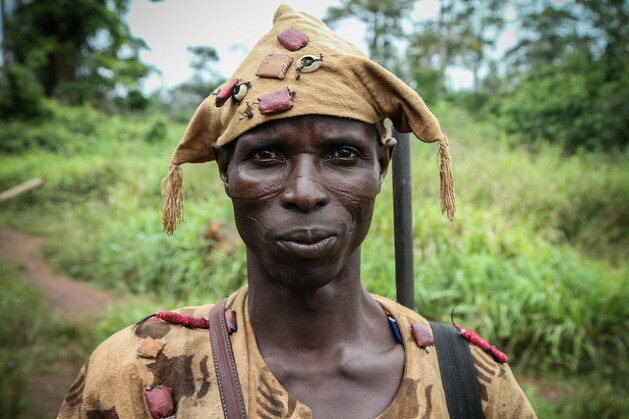 DUÉKOUÉ, Dec 22 2013 (IPS) - In Cote d’Ivoire, traditional hunters known as dozos are accused of human rights abuses and extortion. But in several areas, they also remain the sole guarantor of local safety. Marie Doh looks closely at a posse of three young men wearing traditional gear, standing at a checkpoint. “With their clothes too wide for their skinny bodies, they look a bit comical,” Doh says. But she is not laughing. Each man holds an old rifle in his hands. “They are there for our protection, they say. But they are mostly there to pick up the pennies we can spare them.” Doh claims that she is not “that much” afraid of them, but still gives them 100 CFA (about 20 cents) “several times” a month. The three men are dozos, a traditional hunter brotherhood that has existed in several West African countries for centuries. They recruit beyond ethnic and religious lines, although most are Malinke and Muslim. A report published last week by the U.N. mission in Cote d’Ivoire, UNOCI, claims that at least 228 people have been killed, 164 injured and 162 illegally arrested and detained by dozos in several regions of the country between March 2009 and May 2013. It says that 274 confirmed cases of looting, fire and extortion have been committed by dozos. In Duékoué, a town in the southwestern department of the same name, 12 dozos are seated in the courtyard of an unfinished building. Wearing street clothes, they look more like a social club than a militia. Each dozo must pass through a ritual initiation. They are believed to have mystic powers derived from amulets. “In 2002, we got a call from the prefect,” he says. At the time, an armed uprising of disaffected soldiers had devolved into a civil war that split the country in two. Between 2002 and 2007, Duékoué was in the middle of the “zone de confiance”, a no man’s land between Forces Nouvelles rebels controlling the North and the government-controlled South. For years, lawlessness reigned here. Since the 2010-11 post-electoral crisis, dozos have informally contributed to military operations to secure the area. The chief says there are now 2,300 dozos in the Duékoué region. On his little motorcycle, Souleymane Fofana, the dozos’ security chief, takes IPS on a patrol of Duékoué. “Before we came, when people were going to the fields, they were turned into dead bodies,” he says. Farmer Yacouba Dosso warmly greets Fofana. “We are happy with dozos patrolling. They are our sole protectors,” says the cocoa grower. He explains that there are many robbers, especially during the cocoa harvests as planters come back home with huge sums of money that can reach one million CFAS (around 2,000 dollars). Police and military do not patrol the area. On the way, several checkpoints have been set up by dozos: a branch blocking the small muddy path, a shelter covered with palm branches, a smoking fire with food cooking. Fofana stops his bike in front of a house a few metres from the site of the former Nahibly refugee camp. “This is where five people got killed. Criminals murdered them,” he says. On Jul. 20, 2012, an angry mob estimated at 1000-strong, allegedly led by dozos and members of the national army, attacked the camp. Among the 2,500 inhabitants, mostly ethnic Gueres and supporters of former president Laurent Gbagbo, at least 14 were killed and hundreds more injured. Dozos are not a neutral self-defence group in this region plagued with ethnic tensions. Ivory Coast’s cocoa sector under President Felix Houphouet Boigny – who used to say the land belongs to whoever cultivates it – has attracted Ivoirians from other regions, known as allogenes, as well as foreign workers. This led to several clashes in the last decade with native Guerzes, who say they own the land, and migrants who often have paid for the land but have no clear property titles. In this context, dozos are perceived to protect foreigners and allogenes against disenfranchised, unemployed Guerze youth, who claim their ancestors’ land, and pro-Gbagbo militias who had terrorised the local population. Fofana denies this. “We are not into politics. We just protect communities against bandits,” he claims. “Harassing, killing and hurting people, this is against dozo ethics. A dozo does not kill.” He says human right violations are committed by fake dozos. Still, he believes all the militias should be demobilised and human right violations punished. The government has adopted measures to demobilise and disarm dozos, as well as to redeploy security forces in the region. But the U.N. representative is sceptical. “There is a gap between what is said and what is done. It is a question of political will. The government wants now to demobilise dozos, but it still not has enough policemen and military to do so,” Nindorera says. “Once, gendarmes arrested a dozo. A few hours later, 40 dozos showed up with rifles at the gendarmerie. There is a power relation here that remains to be addressed,” he concludes.